The Hetman palace of Kyrylo Rozumovskyi is the central feature of Baturyn (Chernigiv region, Ukraine). K. Rozumovskyi decided to transfer the capital of the Hetmanate (Ukrainian Cossack State) from Glukhiv to Baturyn town soon after being elected the hetman of Ukraine. Baturyn was re-established as the capital and Rozumovskyi rebuilt the town and ushered in a brief renaissance. He established the manufacturing of carpets, broadcloth, silk, candles, bricks, and ceramic stove tiles, and a stud-farm, a parish school, and a hospital. Hetman also planned to set up a university there. But his intention to gain more autonomy for Ukraine caused imperial wrath and he was removed from his post of Ukraine’s hetman in 1764. Only in 1794 he returned to Baturyn and decided to establish a grandiose palace and a park ensemble. For that purpose he invited the Scottish architect Charles Cameron, whose architectural designs were much appreciated by the Russian Empress Catherine II. Cameron was the chief architect of palaces in Tsarskoye Selo, Pavlovsk and others. The only creation of Charles Cameron in Ukraine is this Palace and park ensemble of K. Rozumovskyi in Baturyn. During 1799-1803 the construction of this historical complex was performed in accordance with his design: the 3-storeyed palace, constructed in the classicism style and 2 outbuildings, located on both sides of it, as well as a great park around them. In 1803 after the death of K. Rozumovskyi everything was changed. The decoration works were stopped, and the palace was abandoned. The fire of 1824 ruined practically all its interior decorations. 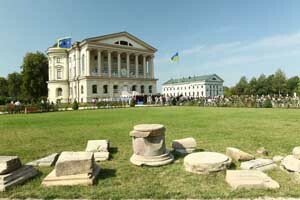 The issue of the palace restoration was raised in 1908 at the XIV All-Russian Archaeological Convention. Since 1911 the palace was under the guardianship of the “Society for Preservation and Protection of the Architectural and Ancient Monuments in Russia”. The great grandson of K. Rozumovskyi, Kamil Lvovych Rozumovskyi, visited Baturyn in 1909. He donated money for the palace restoration with the desire to settle a Folk Art Museum there. An architect from Petersburg Oleksandr Bilogrud worked out the design of restoration, and guided the restoration works till 1913. The further tragic events in the world – WW I and in the revolution in the country put the restoration aside for a long period of time. The building suffered a lot in the fire of 1923. The outbuildings were completely ruined at the beginning of the 20th century. During the World War II the facade walls and the decoration elements of the palace were seriously damaged. The second half of the 20th century has seen several restoration attempts, which preserved the state of the palace, though none of them was completed. So, several attempts to restore the architectural masterpiece were not successful. In 2002, under the initiative of V. Yushchenko, then the Prime-Minister of Ukraine, “The Comprehensive Programme On “Hetman’s Capital” Monuments’ Preservation” was developed. The realization of this Programme started in 2003. The volume of works increased considerably in 2005 – the Ukrainian Maecenases donated money for restoration, and the works for the palace and outbuildings’ restoration were conducted in 2005-2006. In 2007-2008 the State Budget spent significant sums on it as well. 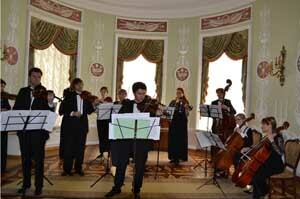 The huge volume of works was performed in 2008 and for the first time in its history the Palace obtained its original state. The palace was opened on August 22, 2009. 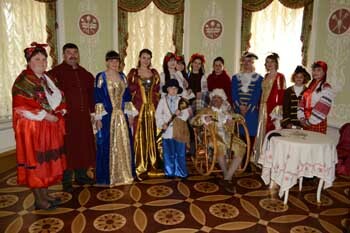 The descendent Gregor Rozumvskyi was invited with his family on the ceremony of the grand opening and he presented the priceless heirloom – a broadsword of Hetman Kyrylo Rozumovskyi. The imposing Hetman palace in all its beauty can compete with the most distinguished palaces of the world. The restorers of the palace managed to recreate the authentic greatness of the palace, saving the concept for one from the best architects of that time, Charles Cameron. 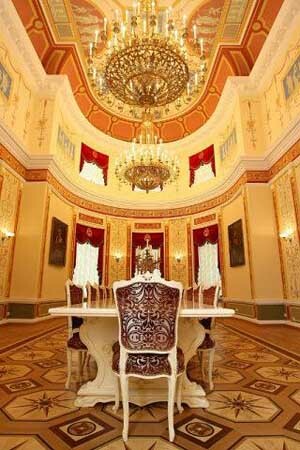 The restorers recreated the modelling and decoratings of the walls, fulfilled interiors with the pictures of Ukrainian hetmans, exclusive chandeliers, floors of palace and artistic parquet. dancing halls amaze with their greatness and grandiosity. You feel the atmosphere of the XIXth century here. The classical music, performed on the old grand piano, conducts the excursions. 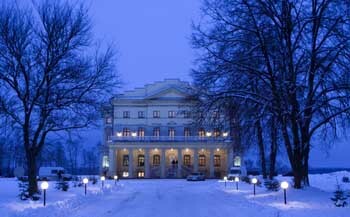 Nowadays the palace of Kyrylo Rozumovskyi is the excellent and remarkable place for different concerts, theatrical performance and weddings. How to get there: Baturyn in located in Chernigiv region, 200 km. from Kyiv on the way Kipti-Gluhiv - Bachevsk, or take the train or bus to Bakhmach or Konotop, and then Baturyn can be reached by bus in half an hour.